Tip: Click the free celebrity birthday ninja poster above to save the high quality version. Everyday a new random design will be generated for you. Collect all 16 ninja poses. 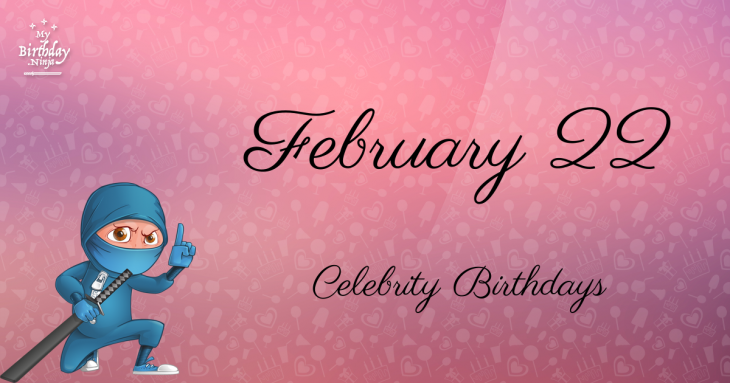 Here’s the epic list of celebrities celebrating February 22nd as their birthday. The list is arranged in chronological order and ONLY includes actors, actresses, models, singers, rappers and producers. Click the after the name to explore the birth date info and know the meaning of their life path number. The zodiac sign of a person born on February 22 is Pisces ♓. Found 59 celebrities. Showing 1 - 30.